Sponsor receives signage throughout the tournament. Registration for 4 individuals to participate in the bowling tournament. Food sponsor for the Tournament and will have signage at the event. Registration for an individual to participate in the bowling tournament. Individuals will be placed with others to make up a team. Prize sponsor receives signage throughout the tournament. We are looking for Sponsors for the Bowling Tournament to give everyone an enjoyable time. 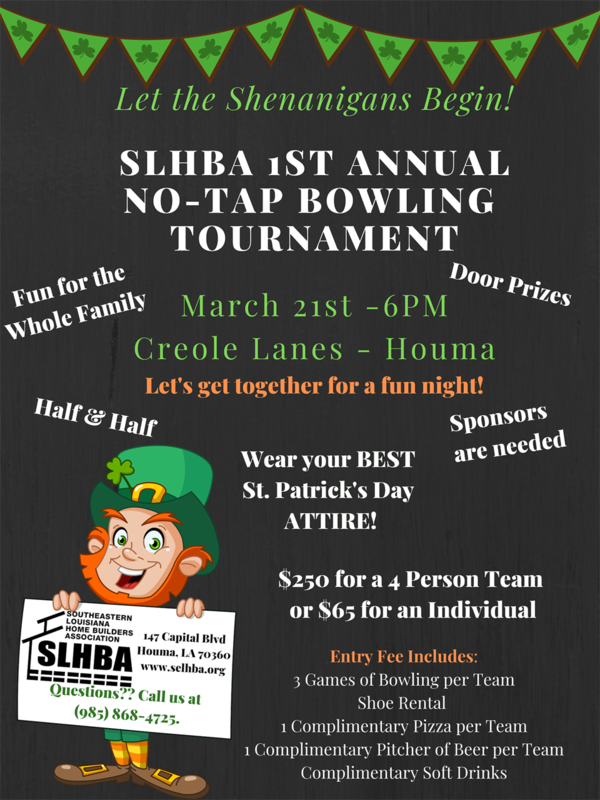 All sponsors will receive signage at Creole Lanes at the event, will be recognized on social media and email. You can register here as a sponsor or print this form to mail or email to us with payment. You can register here online or print this form to mail or email to us with payment. Entries open to any adult or youth bowler at least 10 years of age. Averages - Each team will bowl 2 games. Your average will be your middle score. This might not be your middle game. Handicap will be 100% of 225 figured on middle score. Knock down 9 (nine) pins on first ball it is a strike. Bowling shoes are required. Rental shoes are available at the control desk. No entry fee returned after the tournament starts. Southeastern Louisiana Home Builders Association, Inc. is a professional organization which strives to unite and represent the building industry in St. Mary, Assumption, , Lafourche and Terrebonne parishes. SLHBA is dedicated to the idea of quality housing at affordable prices, thus protecting the "American Dream" of homeownership. Southeastern Louisiana Home Builders Association is a 501(c) 6 non-profit organization.